As a parent, we know you go to great lengths to protect your child’s health. In addition to pediatric doctor’s visits, children also benefit from regular dental visits beginning at a young age. If your child has never visited a dentist before, you probably have a lot of questions about what to expect and when to schedule the first appointment. In this post, we will answer some of the most frequently asked questions so that you can feel more confident and educated about your child’s oral health. What should you look for in a pediatric dentist? There are two things you should look for in a pediatric dentist. The first (and also the most obvious) is the dentist’s qualifications. You should always be taking your child to a reputable office with experience treating children of all ages. The other factor to consider is the assurance and comfort a dentist will provide to your child. Early childhood dental visits set the foundation for a lifetime of oral health. Positive experiences will encourage your child to continue visiting the dentist as an adult, whereas ‘scary’ or negative experience could invoke a lifetime of fear. My child only has baby teeth. Why visit the dentist if they will only fall out? On the surface, primary teeth may seem to serve only a small purpose during the early years of life. However, it is very important to protect these teeth with regular dental visits. Not only do they help your child eat, speak, and chew, but they also serve as place-holders for the bigger permanent teeth that will begin emerging sometime around age 5 or 6. If a primary tooth is allowed to decay, it could result in premature loss, which could affect the alignment of future teeth. What will happen during a pediatric dental visit? Dental visits during early childhood are often educational. 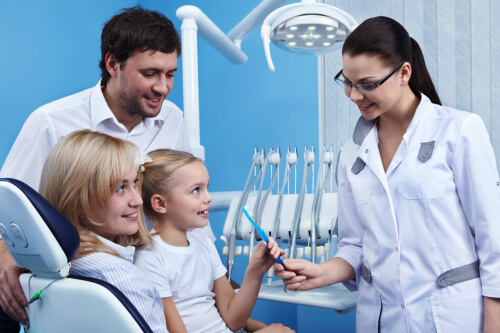 Dentists typically spend time answering questions and explaining pediatric oral health to parents. During these visits, the teeth and gums are examined for signs of decay or disease. As children get older, your dentist may recommend occasional x-rays, professional cleaning, and eventually sealants as the permanent molars begin to erupt the gums. The American Dental Association recommends that parents schedule a first dental appointment within six months of a child’s first tooth appearing, but by the child’s first birthday at the very latest. If you have already missed this deadline, there is no better time than now to begin adopting health oral habits. For more information about pediatric dentistry in Houston or to schedule your child’s first visit, contact the team here at Briter Dental today.